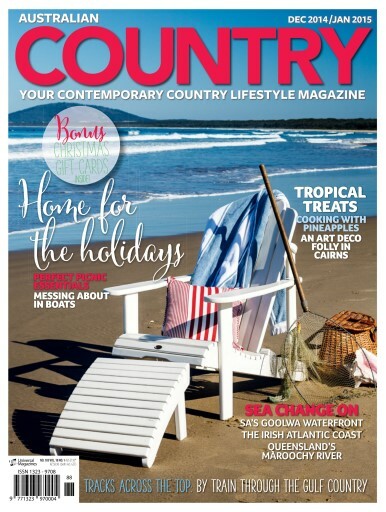 For the next issue of Australian Country we’ve scoured the country for summer inspiration. In Queensland we visited Jo Graham’s gorgeous cottage on the Maroochy River and the amazing Spanish Mission and P&O-influenced Art Deco home Paul and Debra Kinsella have restored high on a hill overlooking Cairns. 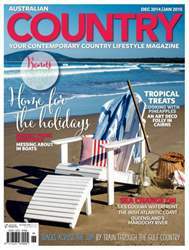 We caught up with the Australian makers of Adirondack chairs at their home near the beach at Berry in NSW and serial renovator Fay Gamble at her home in Goolwa at the mouth of the Murray River in SA. Looking abroad, we join Jane and Myles Lamberth on their journey of restoration of a century-old cottage by the beach in County Waterford in Ireland. Our travel feature celebrates an epic vintage train trip across Queensland’s Gulf country on the Gulflander and Savannahlander and in the NSW high country, we catch up with work in progress on the many historic buildings on Coonghoongbula station at Dalgety. Stylist Sandra Hinton pulls together a riverside picnic, chief cook Kay Francis celebrates the tropical delight of pineapples and our service feature covers the latest looks and accessories for picnics and outdoor entertaining.